Swing On In run weekly swing dance classes at Club Mermaid located at 9 Markeri Street, Mermaid Beach on the Gold Coast (Use temporary entrance from Gold Coast Highway next to tricare). Our swing dance classes are a great way to meet new people and join a friendly community of like minded folk. 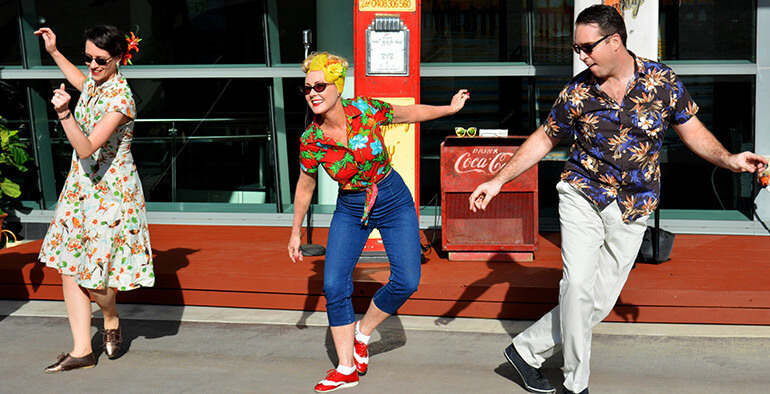 Although swing dancing can be done slow and sensual it is most commonly known as a high-energy dance style. We guarantee you’ll get a great workout when you take part in our dance school classes! Swing dancing encompasses many different styles which means there always something new and exciting to learn that will expand your swing dance move repertoire. As proved in the movie ‘The Great Gatsby’ swing dancing can be performed to contemporary music as well as up-tempo jazz and swing music. Come along to one of our swing dance school classes and learn this enduring dance style that is both easy to learn and fun to do. You don’t need a partner to enjoy a great night out of swing dancing. We are a diverse bunch young and young at heart but most importantly we are friendly enjoy the social aspect of swing dancing and love to welcome all new swing dance enthusiasts (solo or with a partner) to join in the fun. Find out where your nearest dance school is by giving us a call on 0408 306 560. We have classes on 3 nights a week around the south-east Queensland region; Gold Coast (Monday night practice and revision session – Nerang Community Hall, 34 Price Street, Nerang from 7.30pm $5) and Bangalow in northern NSW.